We should be twenty points ahead in the polls, yet the two main parties remain neck and neck. Labour still can’t pull ahead, despite eight years of austerity and now daily Tory infighting. During the 2017 election campaign Jeremy inspired hope and optimism in a way not seen for a generation, with huge turnouts at rallies, and with our vote-share increasing to 40%. Why, then, is it proving so difficult for us to take the next step to government, and what can we do to win a majority? These are the questions we aim to answer in our new book – Spirit of Britain, Purpose of Labour: Building a whole nation politics to reunite our divided country’ – out on Monday 10th September. The starting point for the book is the undeniable fact that our country is more divided than it has been at any time since the Second World War. The EU referendum did not create these divides, but it ruthlessly exposed and deepened them. You were more likely to vote Remain if you were younger, or if you were a graduate, or if you lived in a big city, or if you were wealthier. For Leave voters, read the opposite. For decades these growing divisions in age, education, place and wealth have driven an even greater chasm – they have polarised our values and world views. On one side of the chasm we have the Cosmopolitans: typically university-educated, younger, urban, highly mobile, rights-focused and confident in the modern, globalised world. On the other, the Communitarians: often older, non-graduates who value familiarity, security and community, and have experienced the profound changes of the last 40 years with a sense of loss. As a party that exists in order to drive forward our principles of unity, cohesion and collective endeavour we should clearly be deeply concerned by this state of affairs. But what is even more worrying is that our party actually appears to be part of the problem: a glance at the 2017 general election results shows the extent to which it served to sharpen and entrench the divides. Our party fought back brilliantly during the election campaign, with a manifesto that won support for serious investment in our economy and public services. Yet we only seemed to strengthen our support in constituencies with large numbers of Cosmopolitans. In the 2010 election we won 29% of the vote, which delivered 258 seats, while in 2017 we won 40% of the vote, which delivered 262 seats – four million more votes, but just four more seats. There was a swing against Labour in 130 constituencies, the vast majority of which included high numbers of Communitarians who voted Leave. And it isn’t just an electoral necessity that we represent Communitarians (and for those in doubt, the majority of our target seats are in largely Communitarian areas), this is about our fundamental purpose. The fact that our support is growing amongst young, city-dwelling graduates is of course a cause for celebration; but if we were to become a party that only represents the Cosmopolitans and their values and interests, then we would simply no longer be the Labour Party. The argument at the heart of Spirit of Britain, Purpose of Labour is therefore that only a ‘whole nation’ Labour Party can reunite our deeply divided country and truly govern for the many. We lay out the major shifts that Labour needs to make in order to reconnect with our Communitarian roots, while our team of authors – ranging from MPs Dan Jarvis, Anna Turley, Emma Reynolds, Steve Reed and Justin Madders to the former Remain campaign director Will Straw and Labour Leaver John Mills – set out a Plan for the Common Good that can unite Britain around the aspects of life that matter most to the people we meet day in and day out in our constituencies: Work, Family, Community and Country. The Labour Party, along with many of our sister parties in continental Europe, is stuck between the anti-capitalist, statist, protectionist and conspiracy theory-driven politics of the Hard Left, and the defeatist laissez-faire politics of the Liberal Centre, which sees globalisation as a force of nature that cannot be managed or harnessed for the common good. It is clear to us that neither the politics of the Hard Left or the Liberal Centre can restore the Spirit of Britain, and neither can they serve the true Purpose of Labour. Instead, we must unite our party around mainstream Labour values, principles and policies, as the building blocks for a plan that ensures new technologies and the fourth industrial revolution serve the many; a plan to build public services that are both smart and compassionate; a plan to empower and unite our communities; a plan to restore our ability to stand tall in the world, with credibility, authority and integrity. The analyses and proposals contained in Spirit of Britain, Purpose of Labour are certainly not comprehensive or exhaustive – it is a collection of ideas, not a collective endorsement of any particular position. However, each and every one of our authors knows that our country is crying out for a project of national renewal, designed and led by a whole nation Labour Party that is powered by radical Keynesian economics, a wholehearted commitment to devolving power, and an unequivocally patriotic worldview. Many of those ideas underpinned our 2017 election manifesto, which energised and mobilised the public in ways that we have not seen since 1997. But it would be a fatal error if we were to think that we can win the next election by doubling down on our Cosmopolitan support base. A ‘one more heave’ strategy simply will not cut it, and moreover it would be an abdication of our historic mission and moral purpose as a whole nation party. It is therefore vital that we keep those ideas flowing around our movement, that we challenge each other, and that we see the manifesto as a basis for discussion, rather than as a tablet of stone. My hope is that Jeremy and his team will see and take this book for what it is – an analysis of why so many in our Communitarian heartlands are deserting us; a call to act rapidly and decisively to re-connect because failure to do so could see us losing touch with those communities forever; and a set of constructive proposals that could help our Party to forge a new settlement between the Communitarians and the Cosmopolitans, and in so doing to re-unite our deeply divided country. 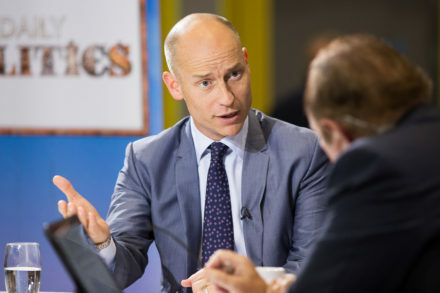 Stephen Kinnock is MP for Aberavon. Joe Jervis co-founded the English Labour Network.